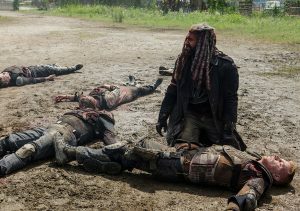 The optimism of King Ezekiel was crushed at the end of last week’s episode when most of his loyal subjects were mowed down by The Saviors. This week picked up right at that moment. The King climbed out from beneath the bodies of those who tried to protect their king from the bullets. The façade of ‘the king’ fell away and what we were left to see was just ‘some guy’ named Zeke. Carol is back! I’m glad! I was getting sick and tired of all her belly aching the last two seasons. 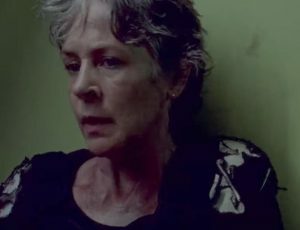 She spots the guns that Rick and Daryl were looking for last week. She takes out a passel of Saviors while inside the compound but once outside she gets cornered behind a car. 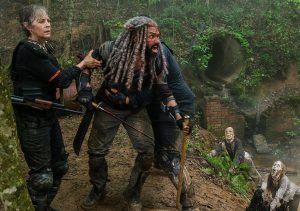 She sees that The Saviors have loaded the guns onto a truck but she also sees Jerry and King Ezekiel by the gate and that they need help. She decides to help The King and allow the Saviors to drive off with the guns. How did she know who was zooming in a fast car towards their direction? Rick and Daryl show up out of nowhere! They are immediately in pursuit of the truck with the guns. It’s a pretty exciting car chase. 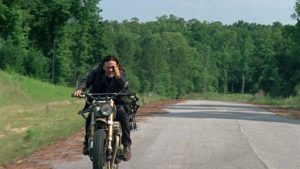 Daryl is on a motorcycle, of course! (A little cross promotion for his show Ride!) He even takes a spill! (a million women held their breath!) He was fine! He got back on his bike and took out the Savior sitting in the back of the truck with a machine gun while Rick jumped from his car into the Savior’s truck, shivs the bearded Savior and runs the car off the road! The whole episode King Ezekiel kept shouting to anyone trying to help him that they needed to leave him and save themselves. But he is their king and they weren’t about to do that. As Carol and Jerry helped Ezekiel they come across a stream and some barrels leaking chemical waste! Of course, they also run into nasty mutated walkers! That is what ‘befell that creature’ that they ran into in Episode 2. Again, The King tells Carol and Jerry to go on and leave him while he fends off the walkers to buy them time. Jerry won’t do it. 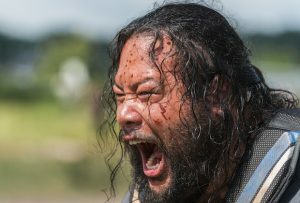 This is where King Ezekiel loses it! “I’m not your king – I’m not your majesty… I’m just some guy!” Just then, Shiva showed up! She starts pouncing and ripping into those nasty walkers allowing our trio to move out of danger. Shiva, however, doesn’t make it. 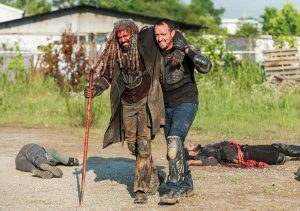 She gets eaten by those nasty walkers as King Ezekiel watched on in horror. The three of them make it back to The Kingdom and walk through the gates looking defeated. We see the flashback to the moment The King led his band of merry men out to battle full of confidence and smiles. Now, he returns with only two other survivors, wounded and bloody. His people gather to greet their king. The little boy whose father we know was killed runs up to him. The king puts his hand on the boy’s shoulder but there are no words of comfort. He walks off silently and sullenly. Will he continue to be ‘The King’ or will he re-emerge simply as “Zeke’, some guy? 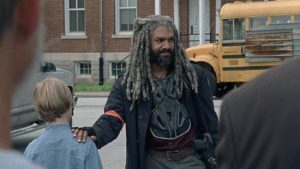 I really liked seeing how Ezekiel turns himself into ‘King Ezekiel’ every morning. Nicely done. Strong acting by everyone in this episode. The best episode, so far, this season, without a doubt. Bummer to see Shiva get eaten but we knew there would be casualties this season. 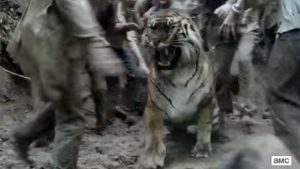 They’re just getting us ready by killing off the CGI tiger. Next up will be a character we know and love, right? Now that Jerry survived this episode I’m not liking Dwight’s chances next week.